Discussion in 'UFC Discussion' started by ElTorro**, Jan 18, 2013. I did not watch TUF: Brazil is Sarafian any good? I know he has big hype behind him, but I never seem him fight. Anyone got a link tot he press conference? Or at least his stare down with Sarafian? I also missed TUF Brazil but lots of people say he's a beast. I originally picked Dollaway to win but switched to Sarafian because everyone is saying it's an easy win for him. I don't know if it's jsut because everyone hates Dollaway or if Sarafian is truly a great prospect. I'm cheering for anyone who fights CB Dollaway. Fartface by UD in a snooze fest. There are few fighters that I flat out can't stand but Dollaway is one of them. Hence, Sarafian is my favorite fighter (at least for tomorrow). The UFC must think Sarafian is legit. Otherwise Rothwell v Gonzaga would be the co-main IMO. It was a very good show. Ya Safarian is good from what was on the show. Even though he looks really squat I think he landed a few headkicks on taller guys. Clarence couldn't finish off a one legged mentally ill Mayhem, by irritated is he revealing his game plan of lay-n-pray and wall-n-stall to a UD.... I find Ben Askren more exhilarating than Clarence. I had him winning TUF until he got injuried. But he is very talented, I can see CB taking a UD though. 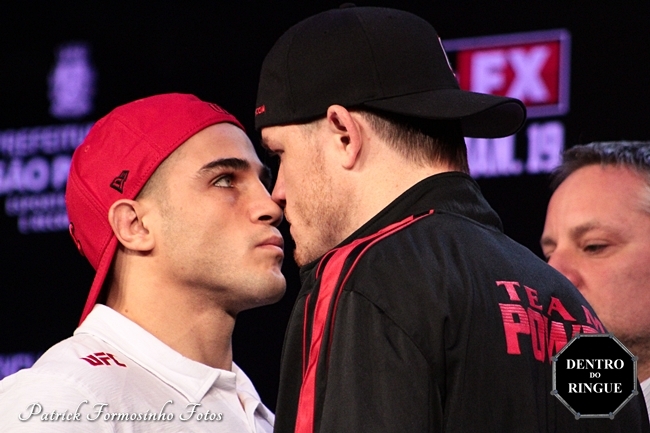 im sure dollaway will be more irritated when he takes a couple shots to the face from Sarafian. hopefully dollaway can pull it out. peruvian necktie for the win. I feel the same, he's one of those guys that I find it hard to root for. I don't know what it is but I find Bader, Aaron Simpson, and CB Dollaway all very unlikable and that's before I knew they were team mates. I don't because CB occasionally gets finished and once won by Peruvian neck tie. Both of those things combined make him way more exciting than Askren. cb dollaway's fight with mayhem was so bad I cannot bear having to care about anything he has to say ever again. Hoping Daniel knocks him out, lol. CB has rubbed me the wrong way since TUF.